Capacity of 256 bearing and belt alignment temperature sensors. The BTA system is compatible with all systems using Type "T" thermocouple sensors. Alarm points can be individually set by the operator. Two individual high-limit variable set points and one rise above ambient (delta) set point for each sensor. System can utilize probe or surface style bearing sensors as well as a full range of brass styles for belt alignment. System integrity checked with the automatic OHM reading feature. Boone shielded thermocouple wire is used on all new systems to ensure accuracy. Temperatures can be downloaded to either a printer or PC. Either Fahrenheit or Celsius scales can be selected from the instrument. An 85 dB. audible alert signal is provided on the instrument. 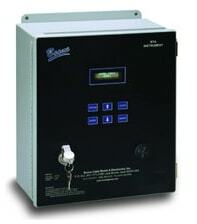 Dry relay contacts are provided to attach an external alarm signal. New bright crystal clear display shows location, temperature and set points. The BTA also works well for Hazard Monitoring and Preventative Maintenance applications in many other industrial venues where safety and down time are critical.